One can see from the chart that ’10-‘11 was basically average for snowfall, and that the amount of snow (330”) was identical to ’07-’08. I would add that the general impression was that consistency of winter temperatures was a bit better than average in ’10-‘11 due to fewer warm events, so the quality of snow surfaces was higher. I’m not sure how much better than average it was though, since it seems that during midwinter, the norm in the higher elevations of the Northern Greens is to have about one warm episode per month. Also, since we were essentially out of the main track of synoptic storms until February, there wasn’t much in the way of moderate-density snowfall to resurface the slopes. I try to address the consistency of temperatures/quality of the snow surfaces in the text below though, at least in the context of weekends; I should note that it’s possible there could have been some midweek weather issues that simply flew under the radar for me. For the quality assessment I simply focused on whether or not we were skiing powder, because unless there is some sort of notable rise in temperatures, there is always powder available. 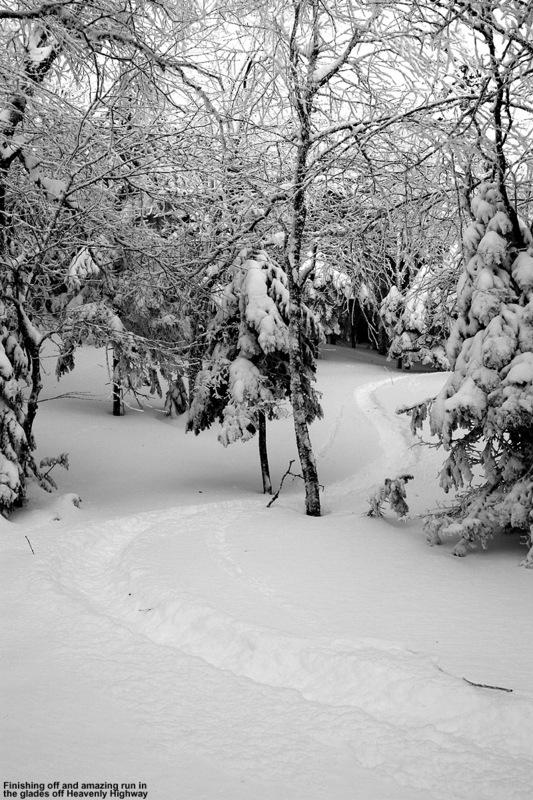 October: Pretty typical in that we got at least some snow for skiing; we had 1.0” of snow at the house. October snowfall in the lower valleys is often minimal enough that the percentages aren’t all that relevant, but that number is 111% vs. the five year average since we’ve been at our house, so indeed that’s rather “normal”. November: Very poor; we got just 2.4” of snow at the house (29% of average) and I don’t really remember it, nor do I have any entries for that month in my ski log, so that says plenty right there. I do have a vague recollection of storm after storm tracking to our north and west giving us mostly rain though, so that would explain the low snowfall total. 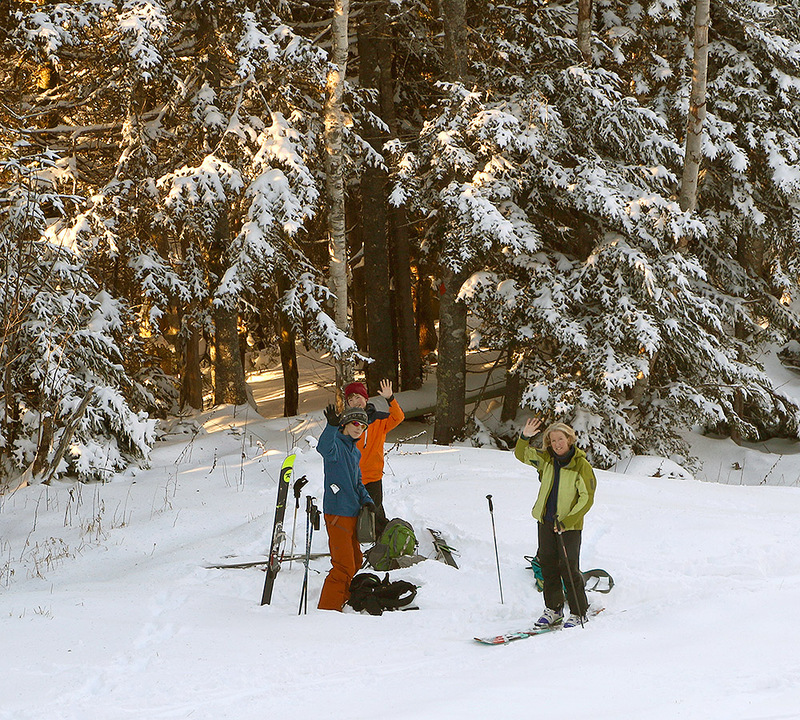 The lack of snowfall wasn’t necessarily a huge concern at the time since it was “only November”, but without good November snowfall, getting to appropriate base depths and excellent skiing in December can be that much harder. December: Quite normal, 46.0” of snow at the house (right about average at 102%). Fortunately, even with minimal November snow we were skiing natural snow terrain by December 10th up at Bolton; the holiday period featured some decent skiing, with 7 outings for me during that stretch, indicating that the snow was obviously OK. Bolton had picked up 4 feet of snow from the storm at the beginning of the month, however, a lot of that snow, as well as what fell later in the month, was upslope fluff. So, even if one assumes a fairly average amount of snowfall for the mountains like we saw in the valley, the very dry nature of the snow meant that there was less liquid than usual, resulting in base depths that really didn’t build quickly. The Boxing Day Storm was unfortunately the start of a pattern that would last the next five to six weeks, with the big synoptic storms staying well south of the region and pounding Southern New England, while northern areas remained on the fringe and essentially survived on fluff. Temperature consistency/snow surface quality: Skiing was done on all 4 weekends of the month, and out of the 12 outings in my records, the only outing without powder skiing was Friday, Dec 31st, so that suggests pretty consistent temperatures. January: We got 55.5” of snow at the house, which is above average (137%) in what can sometimes be a dry, midwinter month. However, January was essentially a month-long continuation of the trend that started on Boxing Day, and we were living on mostly Northern Vermont Champlain Powder™ fluff. 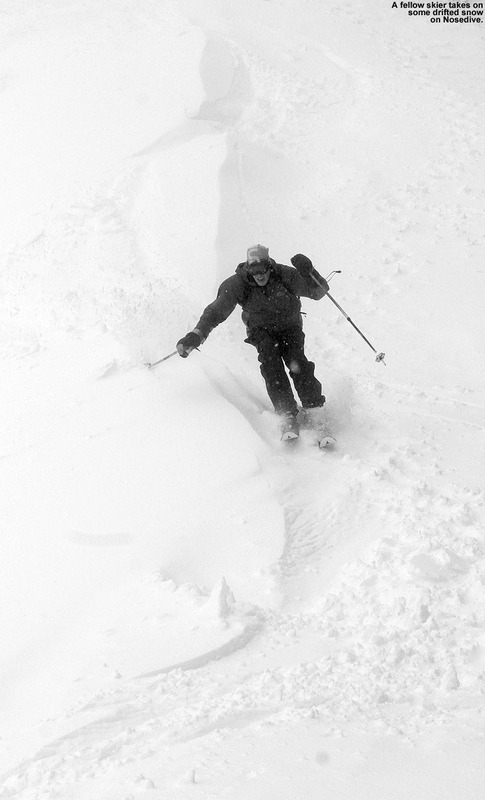 We had a couple of good upslope storms in the early to mid part of the month (January 7th and January 12th) that made for some fine skiing, but obviously since so much of it was pixie dust, the base depths just could not build the way that they would with some synoptic storms. Temperature consistency/snow surface quality: Skiing was done on all 5 weekends of the month, and out of 11 outings in my records, the only outing without powder skiing was Saturday, Jan 1st due to the warmth at the end of December. So I think one could argue that weekend ski surface consistency through Dec/Jan was better than average with only one (instead of two) weekend-affecting warm up(s) for the two months. February: This is when the storm track finally shifted north and we got some notable synoptic storms; the first one was right on the 1st, and then we had a second storm on the 5th. 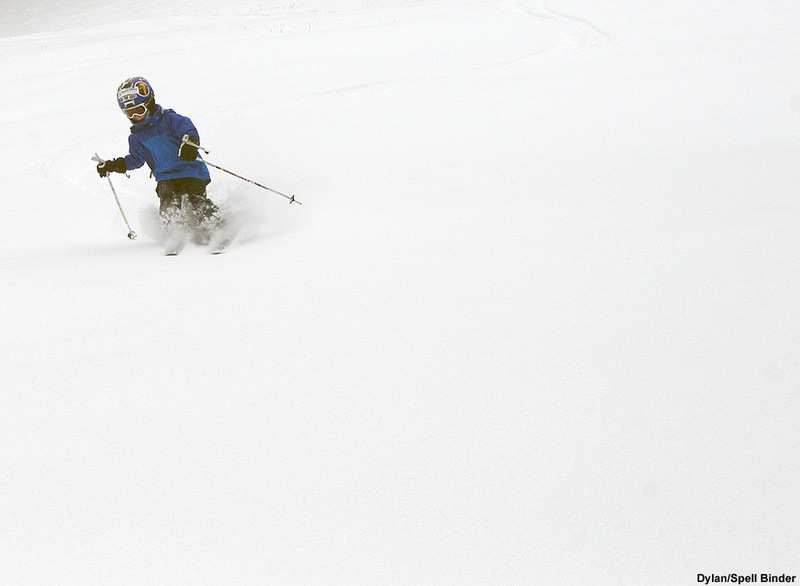 That first storm brought just over a foot of snow for us down in the valley, and was by far the largest for the month. 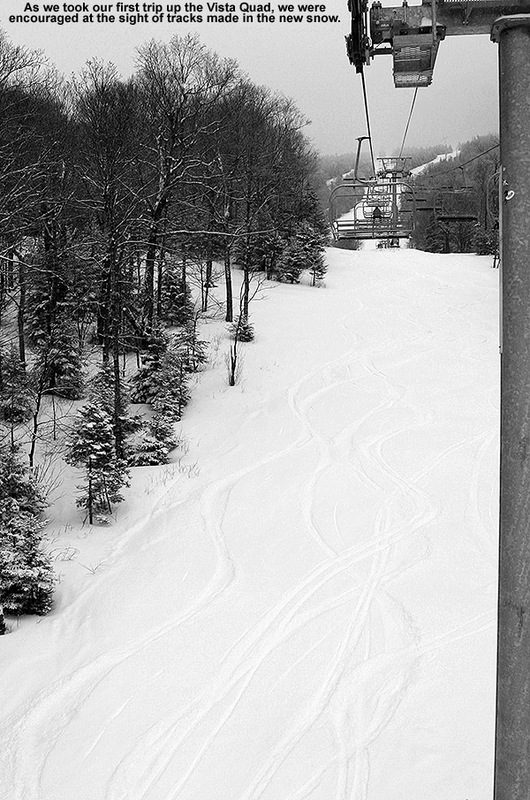 Thus there weren’t really any mega dumps based on my records from the house, but there was plenty of the usual good skiing at Bolton and even good skiing at Stowe. 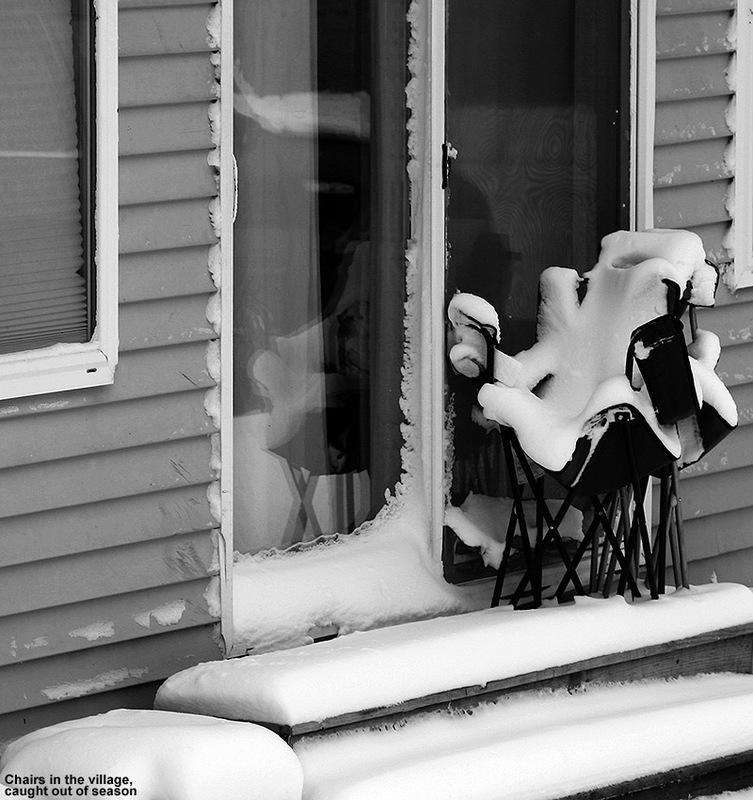 Snowfall was 48.1”, which is roughly average at 108%. Temperature consistency/snow surface quality: Out of the 10 outings in my records, all 10 of them had powder skiing, so February was perfect in that regard. However, while skiing was done on all 4 weekends of the month, we had to wait until Monday of the long weekend to ski because there had been some sort of warm-up. So I’d say the month was pretty typical with at least that one warm-up. March: We continued to stay in the storm track for most of March, with our biggest valley snowfall of the season (25.0”) coming from the March 5th storm. We did wind up with notably above average snowfall in the valley for the month (39.6”; 155%), essentially due to that one big storm and aided by the fact that what I’ve got for a March average could be a bit low due to very poor Marches in ’09 (12.6”) and ’10 (2.1”). 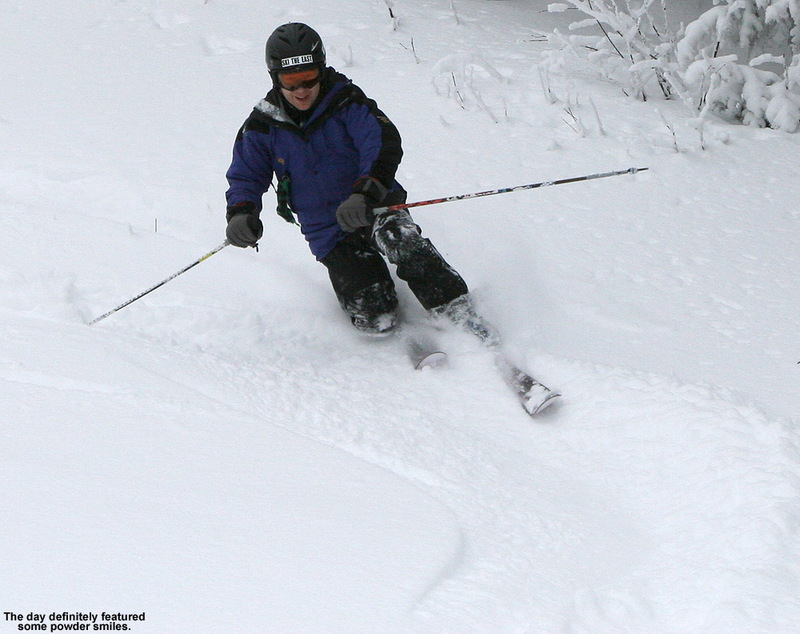 Temperature consistency/snow surface quality: Skiing was done on all 4 weekends of the month, and powder skiing was done on all those weekends, however, there was also notable infiltration of non-powder skiing days into the weekends. 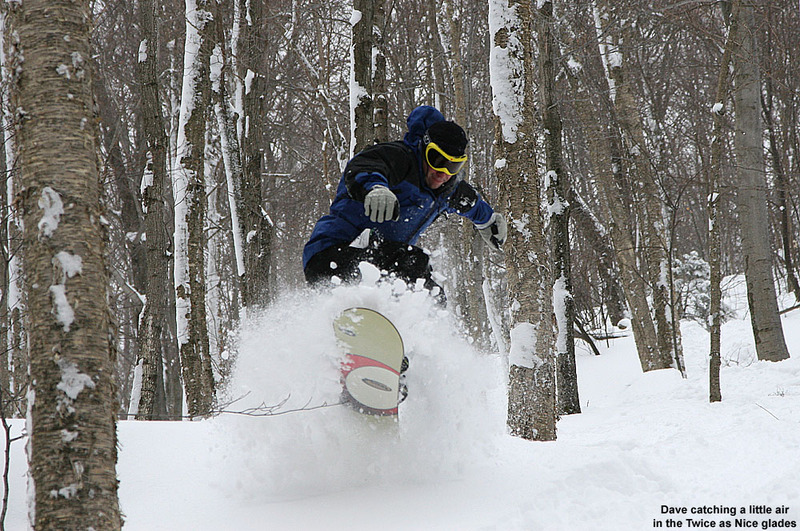 Relative to the previous three months, only 9 of our 12 outings for March featured powder skiing, so while still a pretty good ratio, it was certainly a decrease. Indeed there were multiple warm ups in the month because those three non-powder days were actually on three different weekends (the 1st, 3rd, and 4th weekends). 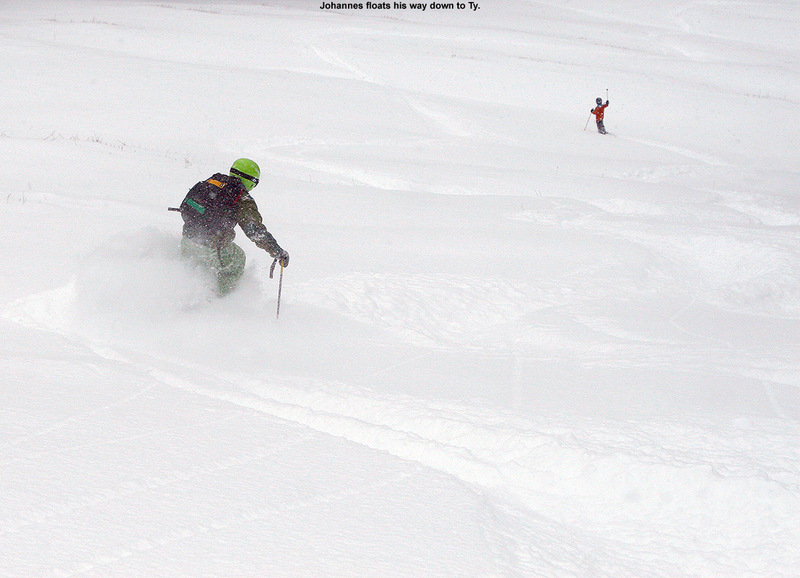 Fortunately, those weekends were somewhat redeemed by powder on the other day. By March, especially toward the end, things may start to fall off a bit from the typical rate of one warm episode per month, but I would expect that with at least 3 individual warm ups in March, it was nothing great or even above average in terms of consistency. April: This was again quite a poor month in terms of snowfall and powder skiing; although snowfall correlation between our location down at the house and the mountains can really start to wane as one moves through April and snowfall becomes more and more elevation dependent. 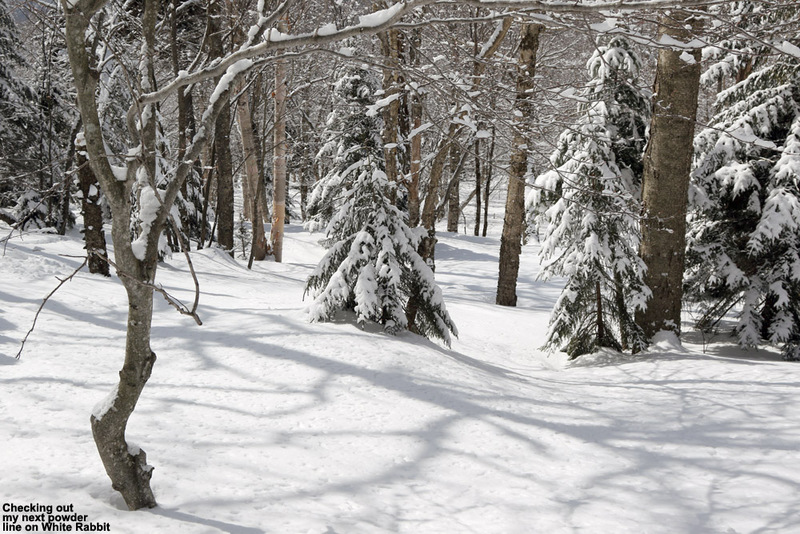 Snowfall at the house was well below average for the month (4.4”; 61%). 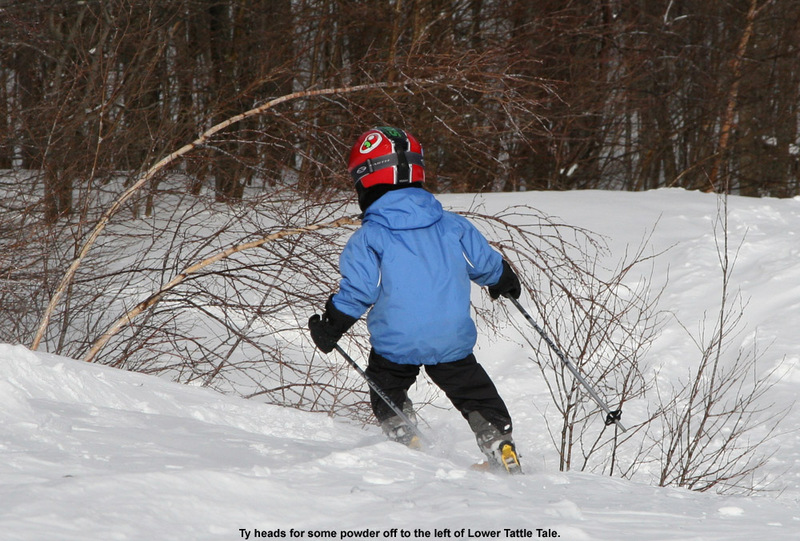 We did at least start out the month with a snowstorm on the 1st and another one on the 4th; these events produced some good weekend powder skiing at Bolton and helped the mountain snowpack to surpass 100 inches at the Mt. Mansfield Stake. However, the snowfall really fell off after that. Temperature consistency/snow surface quality: Skiing was done on all 5 weekends of the month, but only 3 out of 9 days had powder and only 2 of the weekends had powder skiing. People were excited because we had a relatively deep snowpack during the month and coverage stayed longer than normal, but after that first week the storm track had shifted to the north/west and it was just storm after storm that featured warmth and little to no snow, even for the mountains. 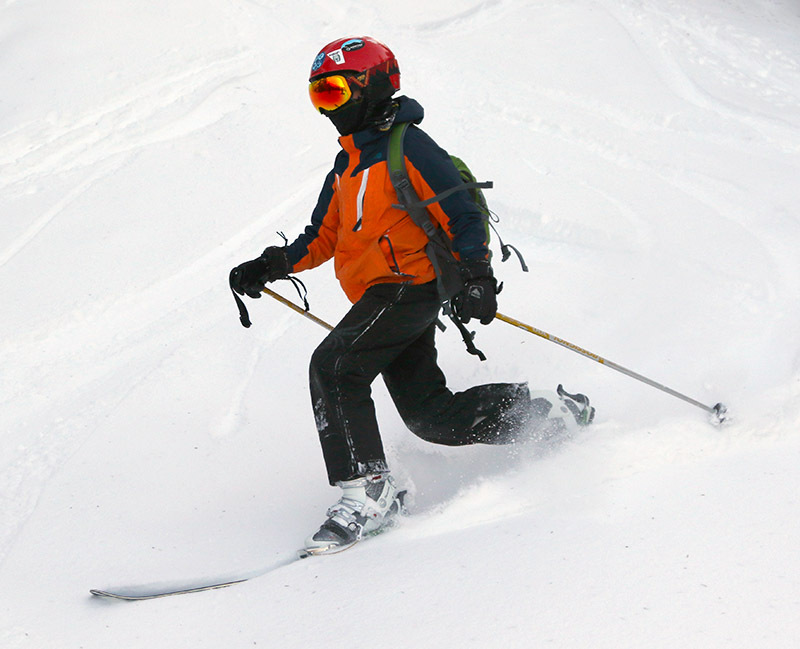 I commented on that trend in a post at Americanwx.com, since there can easily be feet of snow in the higher elevations in April, and instead of just some corn days or spring crud, we could have been skiing some great powder. 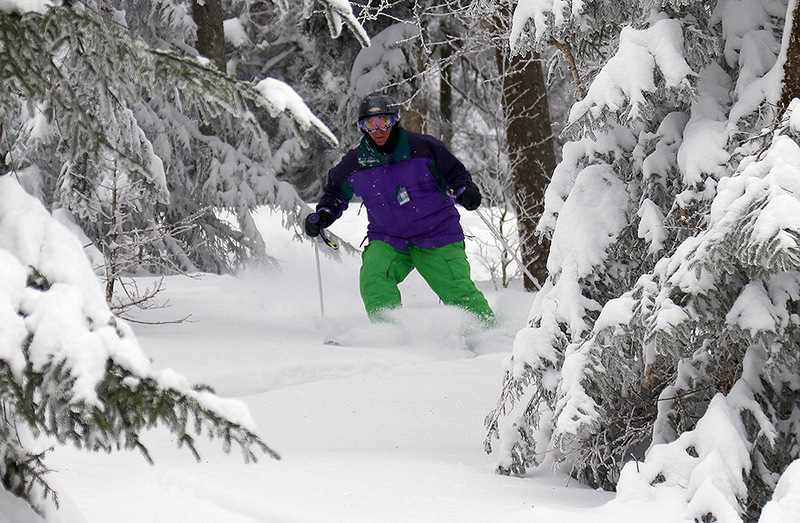 May: The May skiing was good due to the healthy snowpack, and I did get out in the powder on the 6th for top to bottom skiing on Mansfield. We didn’t get any snowfall at the house during the month, but May’s average snowfall numbers down at our elevation are pretty minimal like October, and with the high sun angle and warming as we approach the solstice I suspect even more removed from correlation with what the mountains see. Temperature consistency/snow surface quality: I wouldn’t say May powder is consistent enough to worry about. I only got out for two days during the month, but at least one was a powder day; the other day was a corn snow day at Bolton so that was also good even if there wasn’t fresh snow. 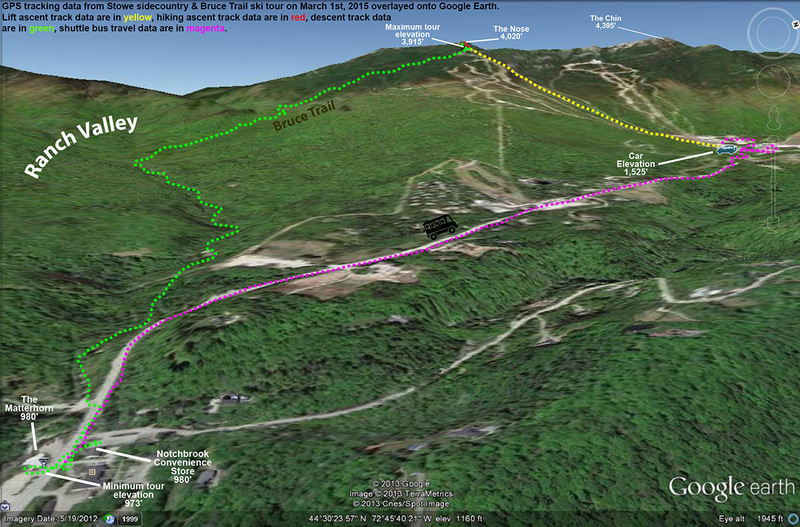 June: Our only day in June was outside VT on the East Snowfields on Mt. Washington, and the snowfield was probably smaller than usual for that time of year due to the below average Mt. Washington snowfall for the season. There actually had been some frozen precipitation in the northern mountains leading up to that day, but we were skiing corn snow. So in terms of overall snowfall, the two above average months of January and March were basically counteracted by the two below average months of November and April, and with the rest of the months being about average, the snowfall for the season ends up… about average. Some plusses were better than average snowpack in April and May, but that’s somewhat counteracted by the lower than average snowpack in November, December, and January. It looks like there was an uptick in consistency in the December-January period due to just that one notable warm-up, but with February and March coming in probably about average in that category, and while November is not especially consistent in terms of temperatures, even in the higher elevations, it must have been below average to get so little snow for the month. So taking the trends of consistency as an aggregate from November through April, I wouldn’t say that there was a massive improvement in temperature consistency/snow quality for this area. Something that I have noticed around here is that having a few more storms with mixed precipitation is not necessarily a huge detractor in terms of snow quality. The ’07-’08 season was a good example of this. We were right in the storm track, so if we did receive some mixed precipitation, there was often another storm on its heels so quickly, that old snow surfaces were covered up. It felt like we were right in the storm track for most of that winter, except that we had a relatively poor April with little snowfall (we picked up just 1.6” of snow at the house, even less than this past April). It is interesting to note that winter ’07-’08 (consistently stormy from November through March) and winter ’10-’11 (biggest synoptic storms focused on just February and March) provide quite disparate examples of how to get to very similar seasonal snowfall totals (203.2” and 197.0” respectively at the house, and 330” and 330” respectively up on the mountain). 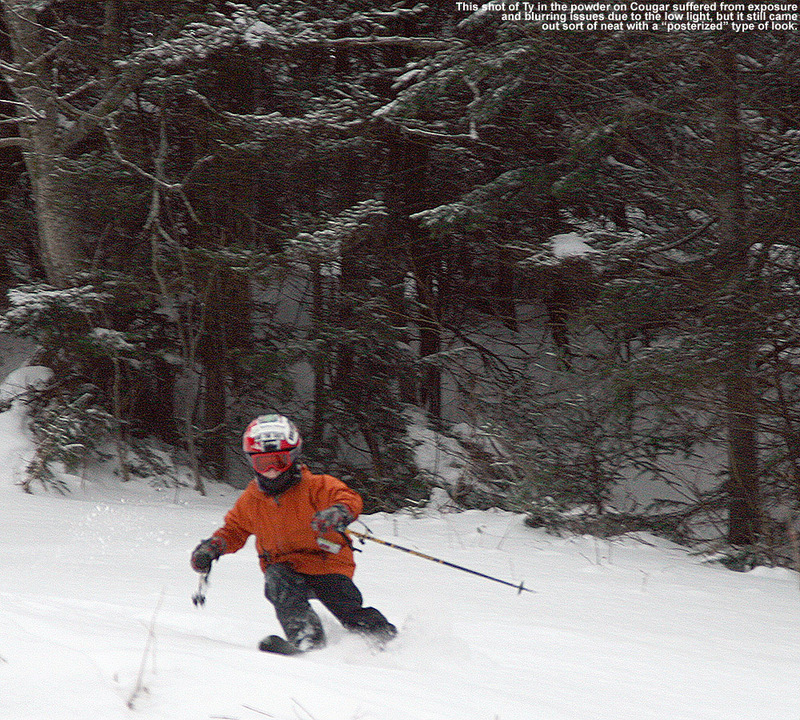 Tree skiing: While working on some web page material, I came across the post I made about the average date for the start of Northern Vermont tree skiing, so I decided to add in the ’10-’11 data and see how the season compared. 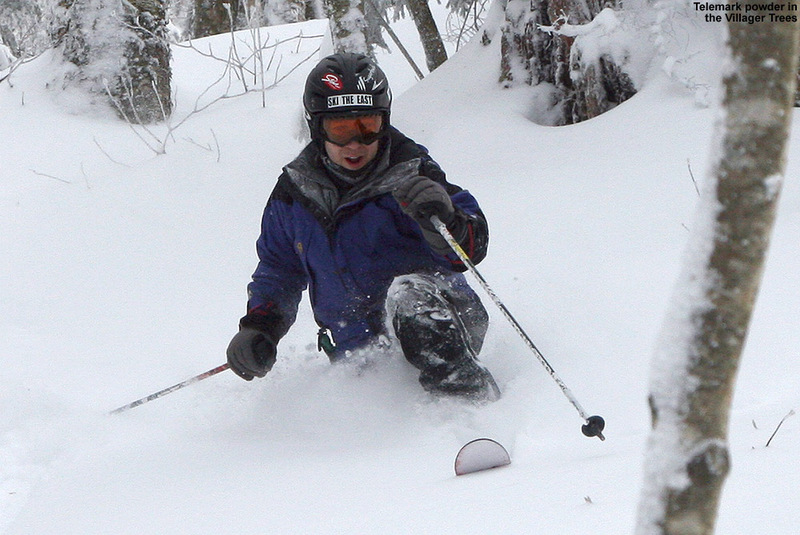 In my initial analysis through the ’09-’10 season, the average start date for tree skiing was December 9th ± 13 days with an average of 28.2 ± 6.8 inches of snowpack at the Mt. Mansfield Stake. In terms of my personal log of outings from last season, I’ve got a start date of December 18th, 2010 for tree skiing, and the addition of these data alters the averages very slightly, bringing the date one day later to December 10th ± 13 days, and the average snowpack down a tenth of an inch to 28.1 ± 6.5 inches. 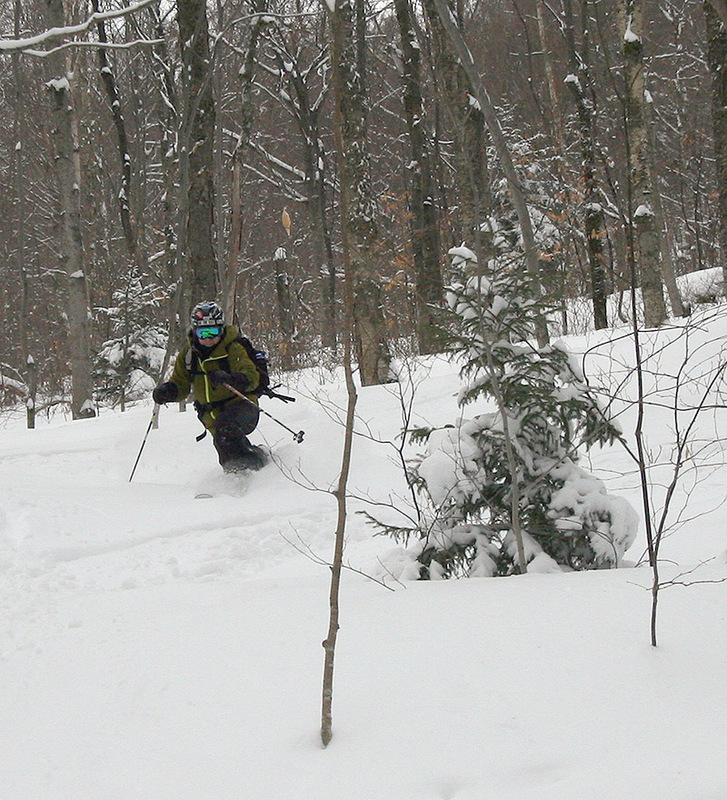 So in terms of the ’10-’11 season, the start to tree skiing was slightly late in that it started about a week later than the mean date I’ve calculated. With the horrible November in terms of snowfall, and much of the December snowfall being dry fluff, the late start is not too surprising. However, the date is well within one standard deviation, so in that sense the start to tree skiing was another parameter of the season that was basically “average”. On that temperature consistency/snow quality note, I was curious about the powder skiing we did throughout the season, so I checked my reports. For the list of outings below, I placed a P whenever we were skiing powder, and put a red X if we weren’t, so it shows the pattern of when we did have powder, and when we did not. Links to the text and pictures for all the individual reports are available below if people want more details about the depth/consistency of the snow, or one can also step through the J&E Productions web log, which has an entry for each outing. 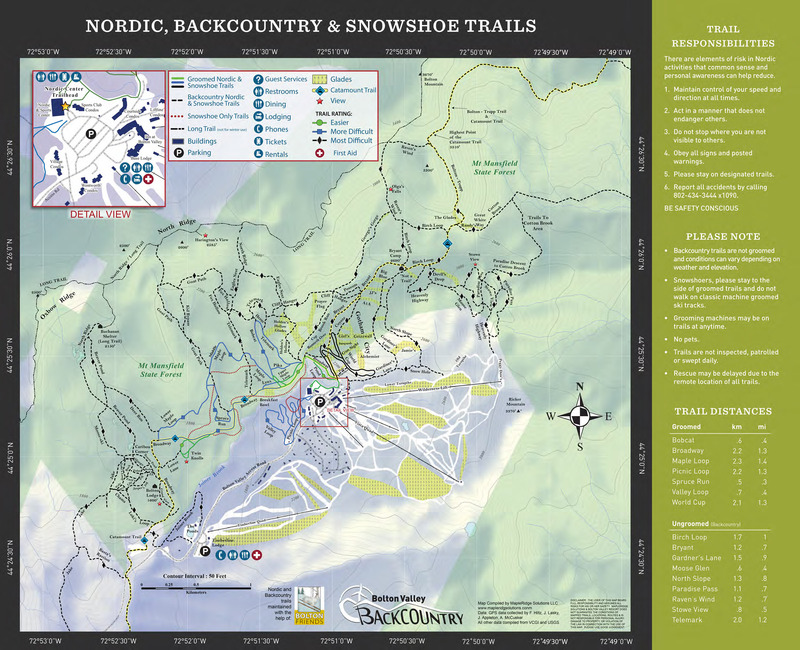 It’s interesting to note that starting at the beginning of the season in October and continuing through to March 26th, there were only four days (December 31st at Bolton Valley, January 1st on the Bolton Valley Nordic/Backcountry Network, March 5th at Cochran’s, and March 20th at Stowe) where we weren’t skiing powder. Strangely enough, I’ve never looked at a season in that way before, but it did give me an even greater appreciation for just how much powder there is to ski around here. 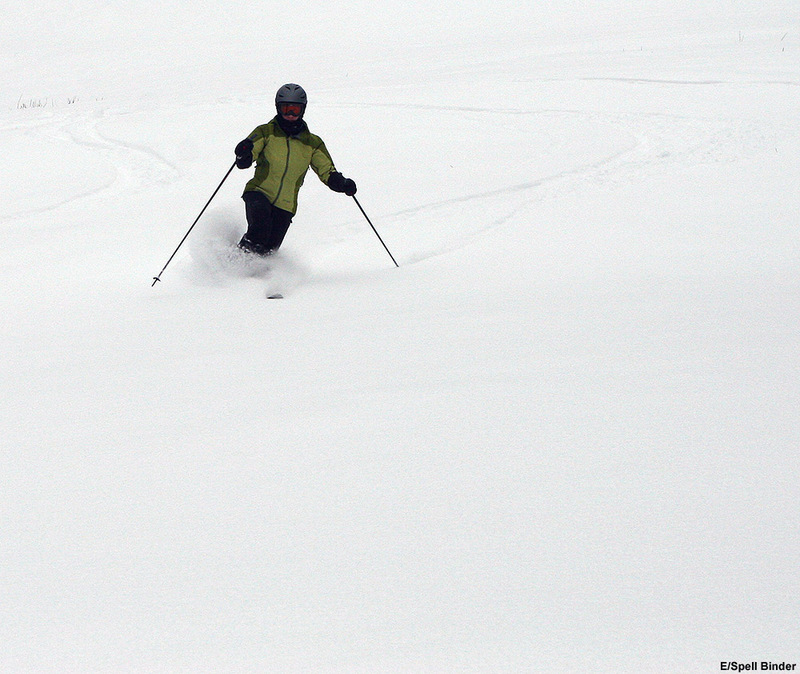 After March 26th, the powder skiing really trickled off this season, although there were still at least a few days in there. I’m not sure how this season compares to others since I’ve never looked at one like this before, but I suspect most other “average” seasons would look similar for the way we ski, and with our pattern of skiing there might be similar patterns even in seasons that deviate more from average snowfall. So yeah, long story short, pretty average season in my book. 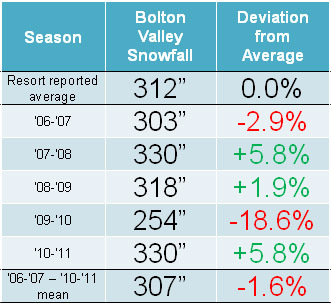 On that note, since we’ve been back from Montana, the only season we’ve had with substantial snowfall deviation from average for Northern Vermont was a negative one in ’09-’10 as I show in that table of Bolton Valley snowfall near the top of the post. There definitely hasn’t been anything like what many parts of the Western U.S. saw last season, but as I look at the list of outings above there’s still been plenty of great skiing. Next PostNext Potential for a little September snow in the Northern Greens?